When I think of July I can’t help but think about the 4th of July. Specifically, fireworks. I grew up in Ohio and fireworks were illegal when I was a kid. That didn’t stop people from having them, but they weren’t real prevalent. At least not in my familial circles. Our neighbors, the Babcock’s, always had fireworks, mainly firecrackers and some M-80’s. If you’ve never heard an M-80 go off, trust me, they are loud. The town of Swanton, where I grew up, did have sanctioned fireworks displays every 4th of July. It was held at the high school football field. It was a big deal as families spread their blankets, brought popcorn etc. and watched as the night sky was lit up with all types of fireworks. I especially liked the big artillery shells that went high into the sky ending with a big boom and multiple displays of color. I still love a good firework show. One summer when we lived in Seattle, we were on Orcas island camping over the 4th . We lucked into a firework display that was held on a little island about 100 yards off shore. We were positioned on the beach in our lawn chairs with nothing between us and the fireworks but water. 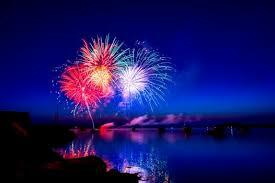 It was a double whammy with the fireworks exploding in the sky and being reflected on the water. One of my more memorable 4th of July viewings. Living in the high desert of Grand Junction, all form of personal fireworks have been banned in Mesa county for 2018 as we’re in the middle of a drought. Deserts by their nature are dry, but without our normal precipitation we are even drier this year. 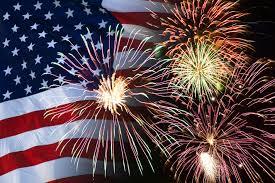 The city will have their normal fireworks display at Lincoln park, controlled and over a well-watered grassy area near the Lincoln park golf course. We view it from a vantage point several hundred feet above the actual staging area. It’s a great display with fireworks exploding in the clear night air framed by the Colorado national monument in the background. I still get the same thrill as an adult as I had when I was a kid. 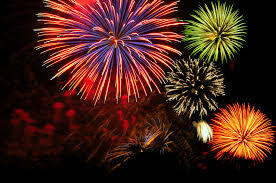 How do they get those colors in fireworks? Ever wonder what causes those colors? It’s metal salts. Strontium carbonate (red), calcium chloride (orange), sodium nitrate (yellow), barium chloride (green), and copper chloride (blue). Purple is created by a combination of strontium(red) and copper(blue). The metal salts are packed into a shell with a delayed fuse, shot out of a cannon (so to speak) by gunpowder, exploded in the air which shoots out stars of metal salts resulting in the beautiful colors we see as spectators. However, you choose to celebrate our country’s Independence Day, we hope that it is safe and enjoyable. If you find yourself short on chairs, tables whatever, give us a call. We probably have it. 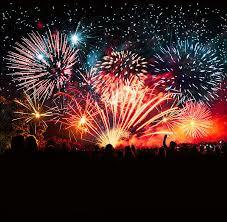 We at Grand events wish you a safe and sane 4th of July.